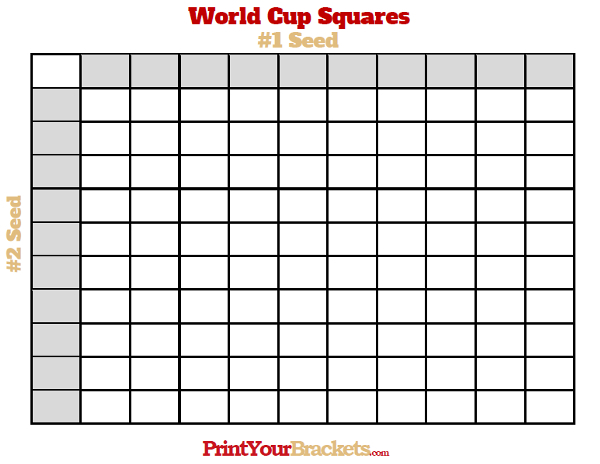 Due to the low scoring of most soccer games, it's difficult to run a typical square grid pool like the Super Bowl Squares, but we've come up with a creative way to make this work. This pool will use the total goals scored by each individual 1 seed and 2 seed in the World Cup Group Stage to create a total of 8 winning squares. The World Cup Group Stage is broken up into 8 groups, lettered A-H, with 4 teams in each group. The teams in each group will play every other team in their group one time. After this is complete the top two teams from each group will be seeded #1 and #2 in the actual World Cup Tournament Bracket. We will use Group A for this example. If after the Group Round is complete, Brazil is awarded the #1 seed and Mexico the #2 seed. For all games played in the Group Round Brazil scored a total of 13 goals and Mexico scored a total of 9 goals. Find the number 3(last digit of 13) in the top row and the number 9 in the left column, the square intersecting these two numbers is the winner. You would do this for each of the 8 groups for a total of 8 winning squares. The steps below explain how to start this pool. Begin by printing the square grid from above and taking it around to family, friends, and co-workers, having each participant place their name in the square or squares of their choice. For a couple of other unique office pools try our World Cup Survivor Pool and our World Cup Confidence Pool.